Beautiful tables are easier to create than you think. 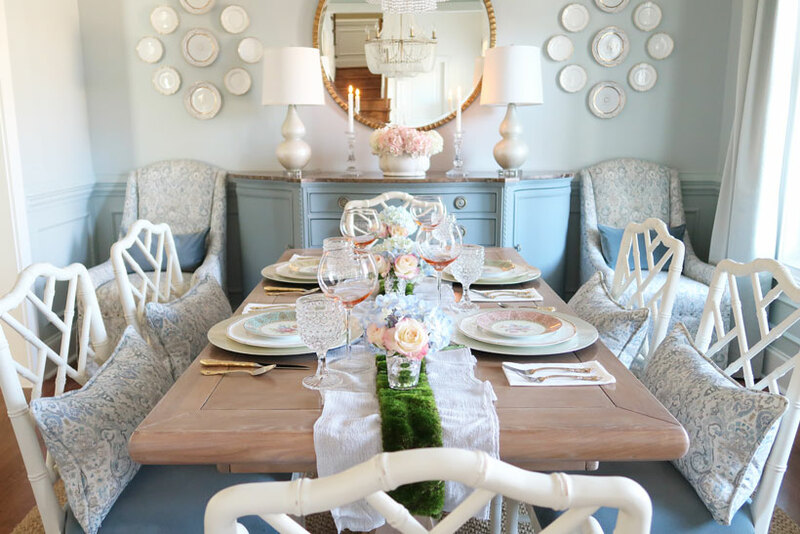 If you’ve ever wondered how to create a Pinterest worthy table, here are your instructions! 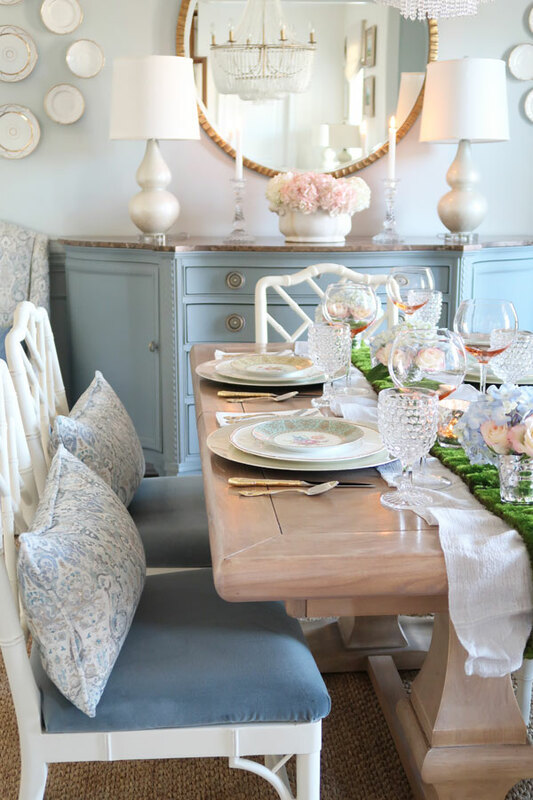 This past winter I decided to study tablescapes that I loved on Pinterest and see what made them so beautiful. Honestly, my number one skill is not creating a beautiful table, but instead a simple one that serves good food! 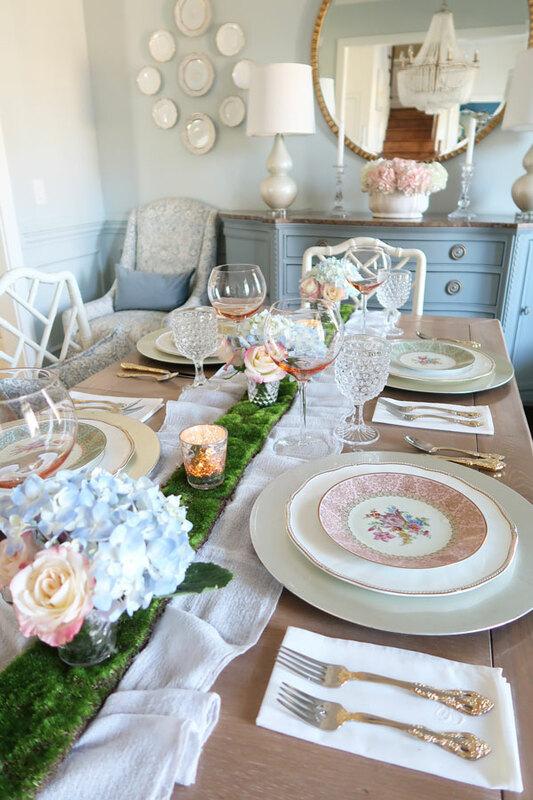 So to help both you and me out, I decided to figure out what makes a special table setting and see if I can put what I’ve learned into action to create a spring tablescape! Is it Pinterest worthy? I’ll let you decide! There are many places to start when crafting a table theme. In reality, starting with how you want your guests to feel is a great beginning. Is this a calm and serene party, let’s celebrate, a formal affair, super casual, or we are just going to eat good food? Recently, I was invited to someone’s home for a birthday dinner. This wasn’t my friend, so I’d never been to their house and didn’t know what to expect. The hostess Julie set the most amazing table lined with various fondue pots, dipping sauces, and sectioned plates. No flowers were needed, the layers of chargers were simple, with neutral colors as a back drop. What did this table tell me? We were in for an eating adventure and lots of fun! 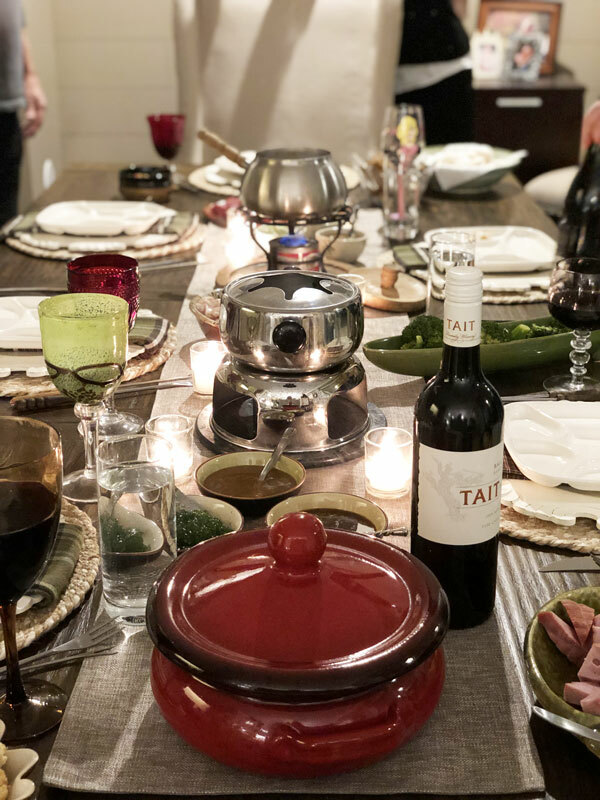 Truly, this was one of the best dinner parties I have ever attended. The table was the backdrop for the food and that’s what brought the color to the setting. See what I mean when I ask what mood or emotion do you want to set? If you start from that, it won’t be so overwhelming. 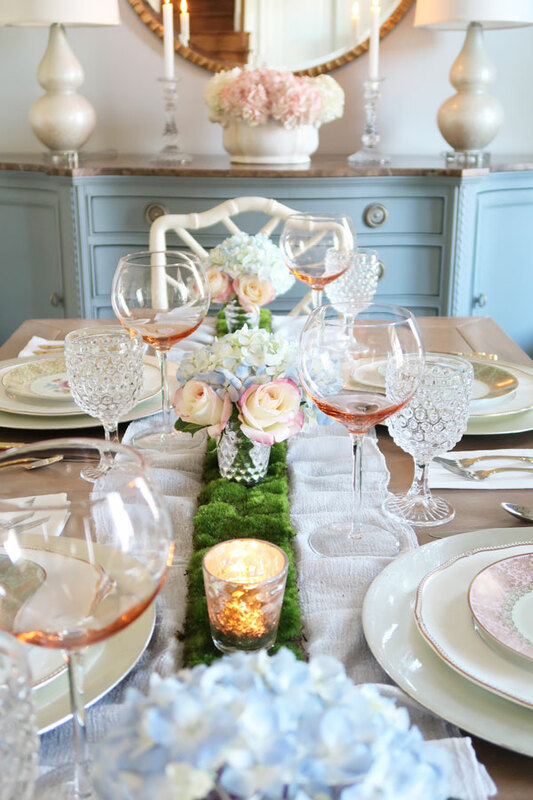 The table doesn’t have to be perfect, but instead make your guest feel like you care about their experience and are happy to have them in your home. 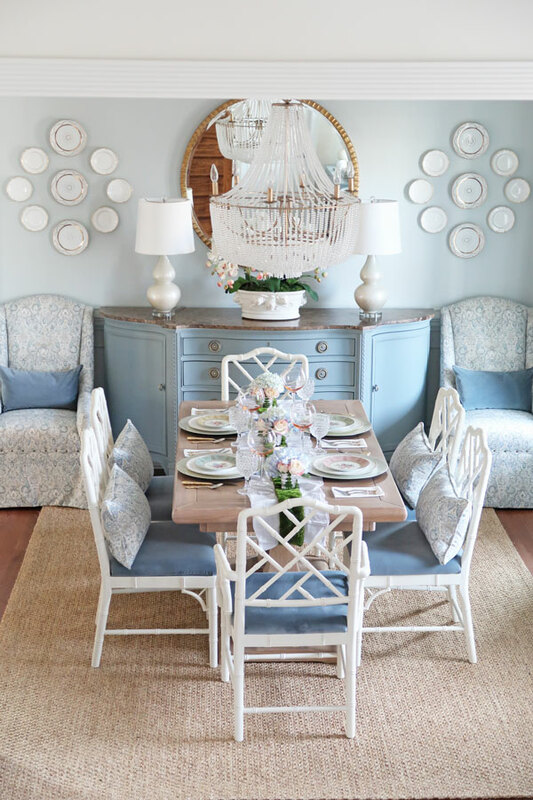 Let’s breakdown the basics of the items you may want to consider having on hand, so you can whip together a beautiful table in under a half hour. Not sure what you need for entertaining? 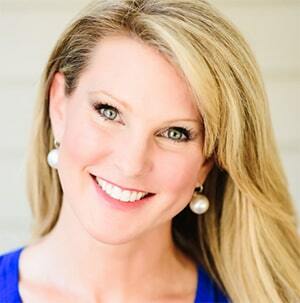 I’ve got a great post on serving essentials you need for your home that you may love! Since my table is SO narrow, I can only use very small bowls for serving. If you have a large and wide table, have fun with large platters that act as a backdrop for the food. You can see that my table sets a completely different tone than the fondue party. What kind of party do you think this is and the emotion I wanted to evoke? 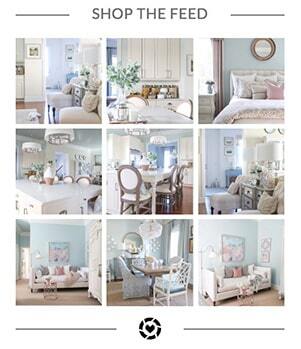 Ya’ll know I love all things pretty and French! Where did I start with this table setting? The vintage plates of course! I love nothing more than having food and wine chatting with my girlfriends, so I decided to create a table that celebrates my girlfriends! The table evokes several emotions. The party is going to be calm and serene, a little less formal, and the food on the lighter side. It’s also likely a daytime lunch or brunch. What you need to know about this table is that I bought nothing else other than flowers from the grocery store! Having the basic items on hand helped me put this together in under 30 minutes. Using the plates as a guide for color I selected the various shades of green, pink and blue. 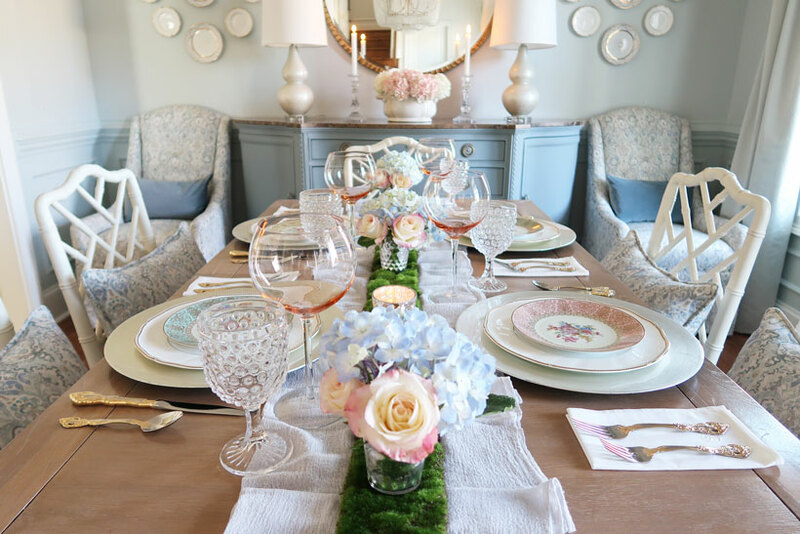 The vintage plates are bread plates, so “technically” not correct from a table setting perspective. My plan was to use them to set the tone and not serve from them. 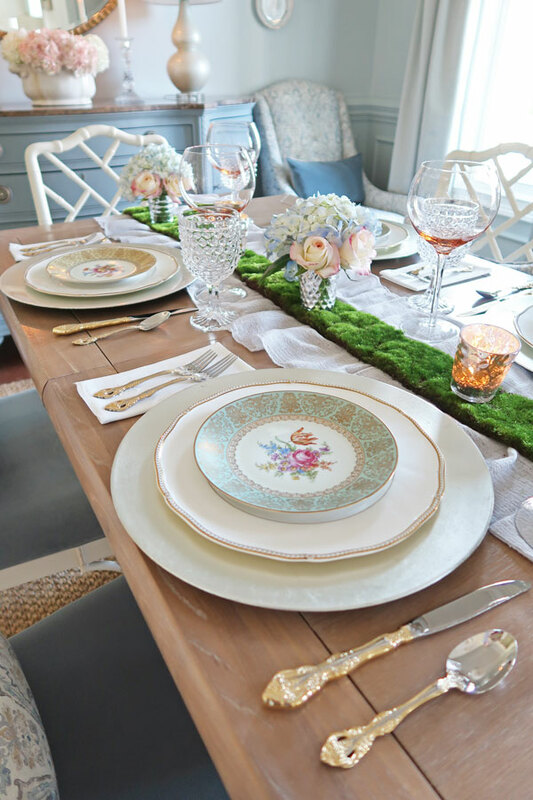 Whenever you are out at a flea market or at Home Goods, keep your eye out for fun plate finds to use in a tablescape. The mercury glass votives have a bubble pattern that I picked up again with the hobnail water glasses. Then the green moss runner was a cool clearance find last summer from Michael’s! A mossy backdrop provides a little quirky fun and says this is a garden party! 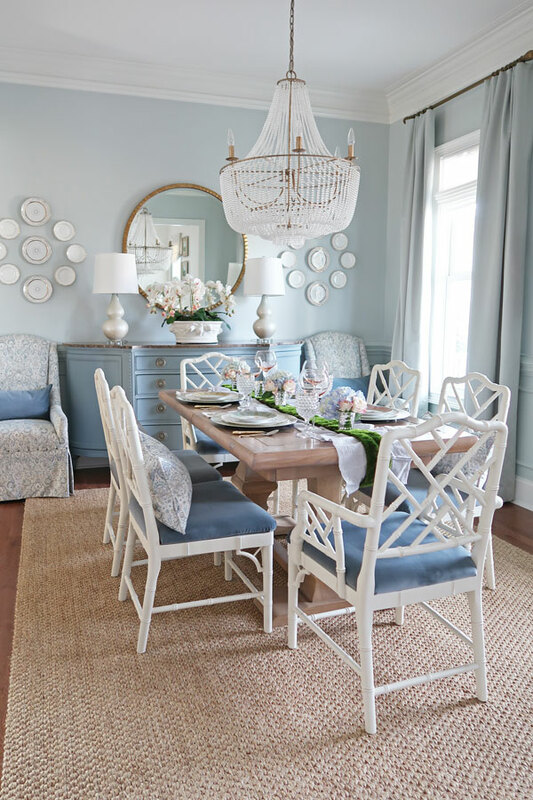 To soften the look of the table and make it less formal, instead of doing a flat and straight runner, I ruched a gauzy dusty blue runner. It’s these little details that change the look and mood of the table. Then to add a little more texture and color variety, I mixed simple antique silver chargers with my formal gold lined china. The flatware pulls both metals of gold and silver together for a unified look. Freshly pressed white linen napkins were placed as a simple statement. No napkin rings were used, since this is a brunch or lunch to keep it less formal. I love nothing more than crisp white linen on a table! How lucky was I to find these perfect roses at my local grocery store? 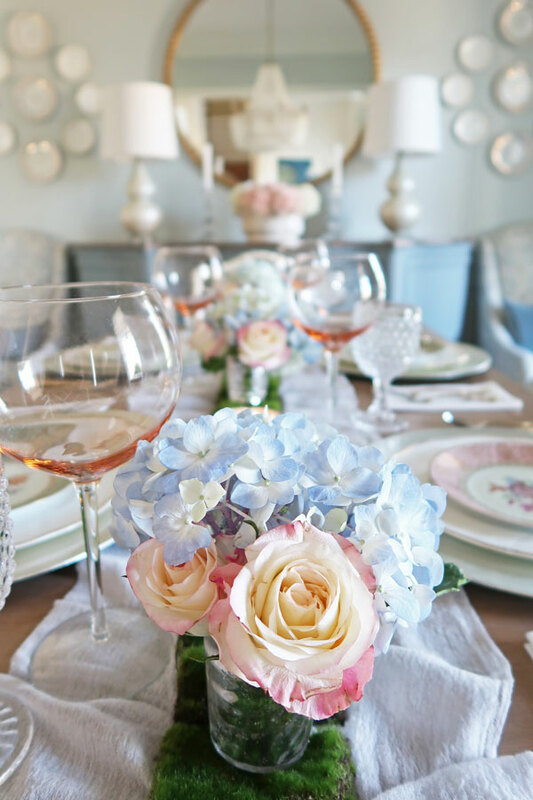 Pairing them with soft blue hydrangeas creates the prettiest color combination against the green moss back drop. To keep the flowers fresh, I just added a little water to the votive and trimmed the stems short to just clear the top of the votive. Easy! Then to make everyone sink in and relax, I added pillows to the chair backs. The goal is making people want to linger a little longer because they are so comfortable and having a good time! It’s so glowy and soft in this room with the candles lit – even during the daytime! Here is the room the next day, when it was cloudy. No candles are lit and I replaced the arrangement on the credenza with my regular orchids. It’s fun how just changing a few elements gives the room another vibe. I like how the moss is repeated in the orchid planter. Who wants to join me for this ladies lunch? Just in time for spring and daylight savings time! Sorry, I couldn’t find the exact moss runner so please check a Michael’s stores to see if they have them again this year. Paired things in 3’s: flowers and plates. Always us uneven numbers for maximum visual interest. Tall smooth colored wine glasses paired with shorter textured shorter water glasses. The high-low effect creates tension on the table. Mirrored reflective votives help to reflect colors on the table and bounce around the light for another layer. 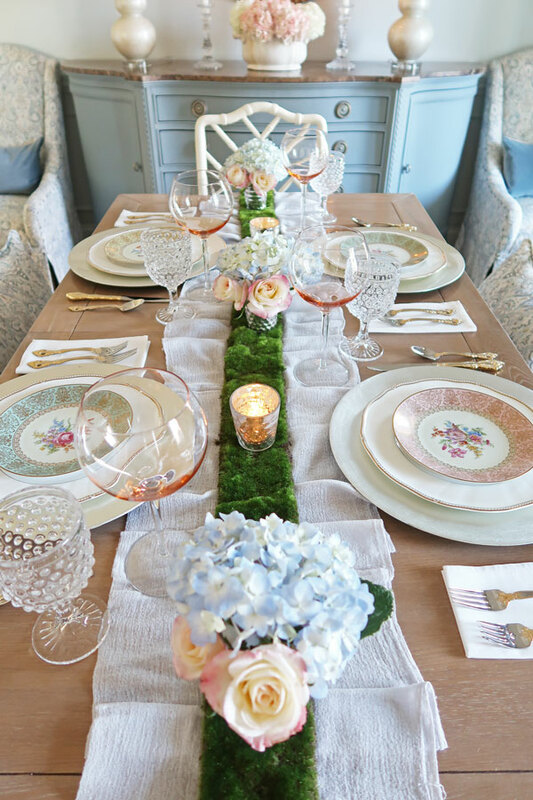 Mixing flowers in the same colors as the plates ties the entire table together. Doing a less formal table runner set the tone for a more lunch or brunch feel. Time for wine and laughter! Lighted candles add a glow to the room and everyone looks better in candlelight! So, how did I do? Is this table Pinterest worthy? 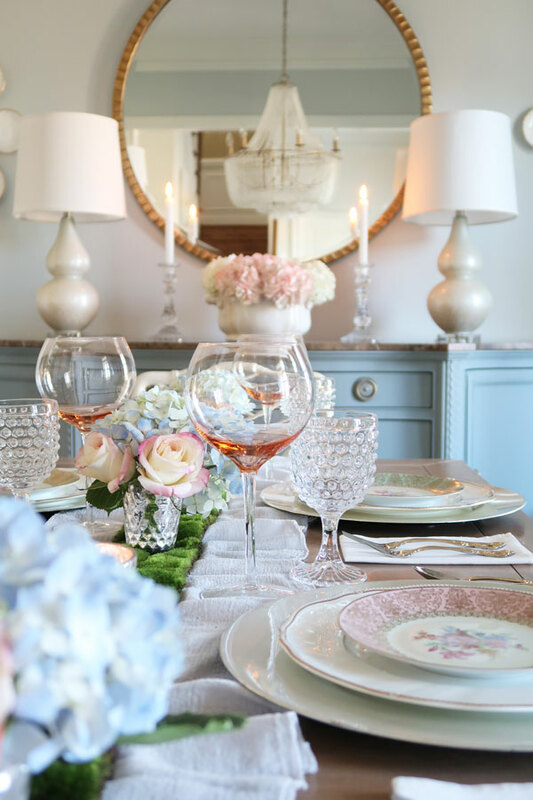 If not, I have an entire Tablescape Pinterest board for you to peruse! 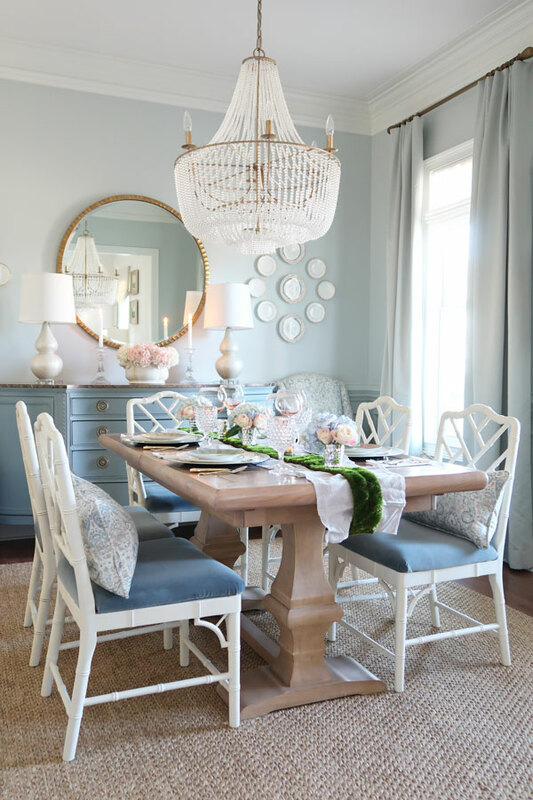 Plus this past Christmas, I featured some swoonworthy tables for the holidays you may enjoy. Next time you plan a party, I hope you have a whole new perspective on how to set the table or even your kitchen island! Set the tone for the party and let the guests enjoy all of your love and hard work. Please consider signing up for my weekly email newsletter, so you never miss a post, tip or trick!